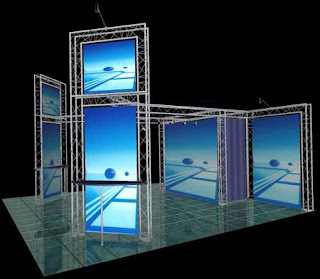 DisplaysExhibits.com features exclusively the Milos QuickTruss System. QuickTruss is more than just a product, it will change the way you look at and use truss systems forever. It's a perfect combination of Style, Strength, Speed and Ease. All QuickTruss Systems feature solid conical connectors and tapered pins for an extremely fast, simple and secure assembly of structures. All truss ends are fitted with precision CNC machined receivers and braced with horizontal end spars creating an extremely durable construction perfect for continuous use in harsh environments. The common connection method enables sections to be joined to any other component in the appropriate range without any problem ( Curve to Curve / Curves to Straight / Junctions / Baseplates etc.) This capability provides a virtually infinite number of configurations, enabling customers to maximize use and investments in our products.